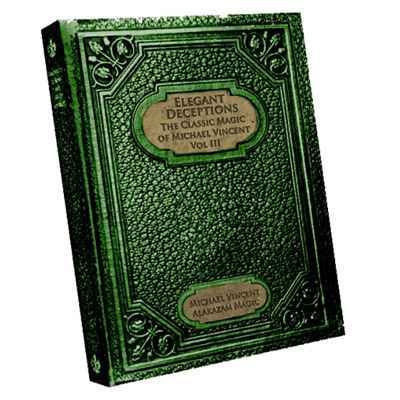 Welcome to "The Classic Magic of Michael Vincent Volume 3 - Elegant Deceptions"
Volume 3 continues with the same intention as Volumes 1 and 2 - that is to transform the learning of magic through the medium of video. Over the last year, Michael Vincent has broken new ground in merging the video medium with his dynamic teaching style. Michael has made a significant impact in the market place to such an extent that this new video has been anticipated with great expectation. This new release from Alakazam Magic showcases Michael Vincent at his very best, as a performance driven artist. The material on this video was designed with one intention; to be shared was an audience. In studying this video, it is our hope that you will feel the passion, drive and enthusiasm that Michael brings to every performance. Alakazam Magic hopes that you will be inspired by what you learn so that you can emulate the qualities that makes the Michael Vincent experience of magic such a precious commodity. The values that Michael holds dear are rooted in a commitment to technical and artistic excellence and a desire to provide his audience with that rare thrill of pure astonishment. In continuing this series, Michael has deliberately taken the approach of communicating to you as his personal students. He takes for granted that you have taken the time to study the first two volumes because volume 3 picks up the pace and expands the possibilities of what can be achieved with more advanced skill and artistic delivery. The performances given in the live show and in the intimacy of the bar will showcase the impact that quality magic, well presented, can have on a lay audience. Here is your opportunity to take your magic and performance to the next level. Thank you for continuing your journey with Michael Vincent and Alakazam Magic. Borrowed Deck Conversation With Chris Harding. Reading "Tells" - An idea inspired by Juan Tamariz with special thanks to Darwin Ortiz. A Match Made in Heaven - Dai Vernon's "Matching the Cards" (from a borrowed Shuffled Deck). Irv Weiner's "Triple Transposition"....One simple Technique sets you up for an amazing series of transpositions. This section is an intriguing conversation about the benefits of mastering "The Cull" so that you can work with a borrowed deck. Here, Michael performs some impromptu card magic with a deck supplied by Chris Harding. In this final conversation, Michael imparts his knowledge and wisdom in the hope that it inspires you all to continue thinking and expanding the possibilities for your magic. The Ladies Looking Glass - Here is a master class in how to take ancient classic first published in 1868 and bring it kicking and screaming into the 21st century. Michael's performance and explanation is an inspired study in technical mastery and artistic self - expression; Professor Comte and Robert Houdin would have loved this!